After posting an image and tying sequence for the Wonder Bug sample (go to http://www.fishingwithflies.com/WonderBug.htm) sent to me by Fred Bridge of Pennsylvannia, another friend of mine from Pennsylvannia, Bill Long, wrote (see comments on my previous blog post) that it reminded him of a similarly tied "clipped hackle" fly called the Anytime, Anywhere Nymph. It too, he wrote, was an old pattern. Perhaps these two patterns are related, and perhaps they are not. The patterns are simple enough to have been "invented" by many tiers. After all, they are both essentially woolly worms with clipped hackle. I thought I would investigate further. 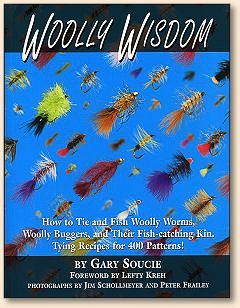 Referring to my copy of Gary Soucie's Woolly Wisdom (copyrighted 2005), I found a section on Clipped Hackle Woolly Worms (pp. 51-61). The Anytime, Anywhere Nymph is included. It is tied essentially like the Wonder Bug, except that instead of a herl body it has a black chenille body. Using Google I found two other descriptions of the Anytime-Anywhere Nymph; one with a body of black wool and the other with a body of black dubbing. So, a black body is a key feature. This is where I become confused. Gary's book also has a "C.K. Nymph". The C.K. Nymph is on the opposing page (p. 57) to the "Anytime, Anywhere Nymph" (p. 56). Gary suggests that perhaps the later is a variation of the former. At this point in my research I assumed that C.K. stood for Charles Knight. However, Gary's interview with a couple of flyfishers, who remember the C.K. Nymph from their early days, place its introduction in the late 1940s or early 1950s, along the "C.K. Williams stretch" of the Bushkill Creek in Pennsylvannia. C.K. Williams was the name of an old pigment production plant situated near the creek. Do any of my Pennsylvania friends have any additional insights or information about the origins of this simple fly? Of course, you don't have to be from Pennsylvania to post a comment *grin*.